Well, I hope it's not too late to submit my first and last report (better late rather than not 😭). This is just a simple attestation bot that attests your Github profile. I participate Byteball Use-a-Thon before with this idea and this bot is a small step to realize that idea. I try to write it as simple as possible which resulting that it only has ~100 lines of code 😆 (it probably will be reduced more once I refactor the library that I create). What takes it so long? If you read the code, you will notice that I don't use the headless-wallet as the dependency. That's because I wrap and shim it on a library that I create called botbyte (I will give more details later in utopian post after cleaning it up). It took a while to understand byteballcore and headless-byteball and I often bump into a problem like can't run the example bot, IP banned from the Testnet hub (thanks to @papabyte for creating a relay for me that I can avoid IP ban 🤗), and many more. 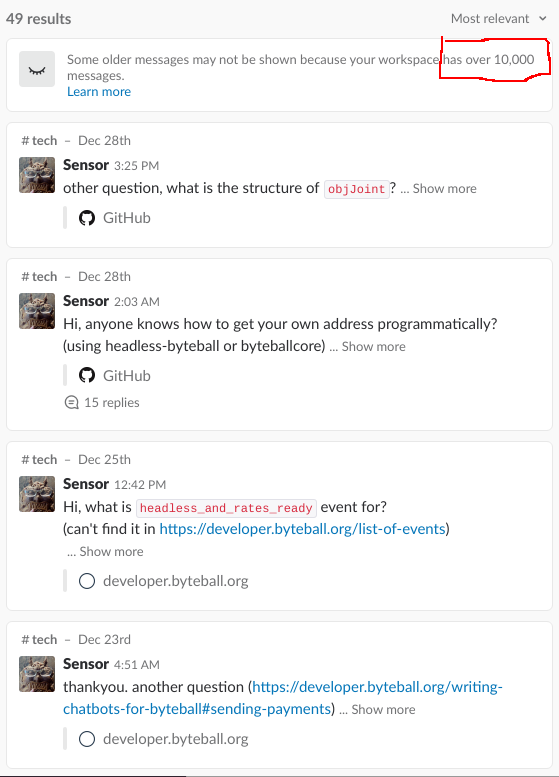 Most of the time I ask those problems in slack on the #tech channel at weekend and salute to all core developer for trying to answer my problem 🥺. I hope for a technical discussion and Q&A, I can ask it on discord or other chat that not limit the chat history because I sometimes search chat history for previous answer/quote. This is the first step when the bot gets into the topic. 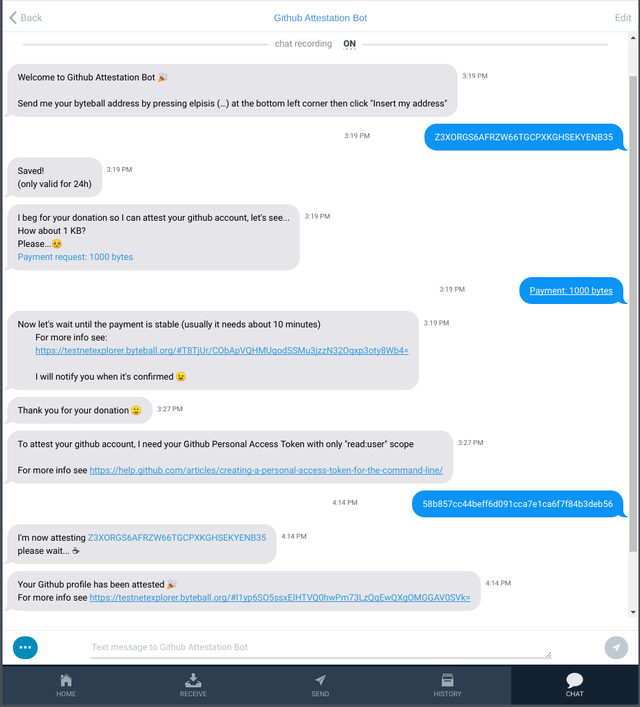 When the pairing successful, it will enter the topic ask:address which the bot will send a message asking them to send their wallet address. This is also the first time the cache storage get populated. 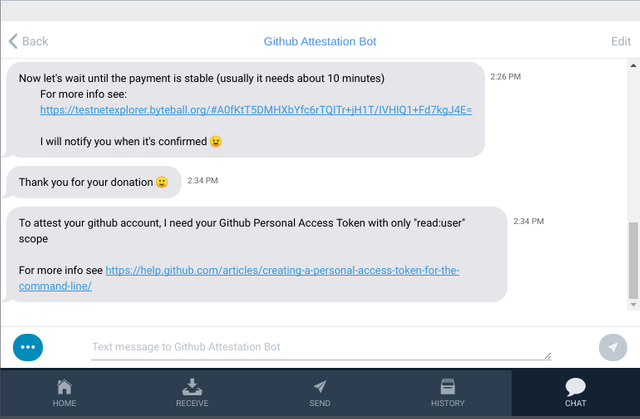 When user send any amount of payment and the transaction was stable/confirmed, the bot will move the topic conversation from ask:donation to ask:gh_token then message the user asking for their Github personal access token. This is the last step of this attestation bot. Ideally, when we are talking about a service that connects/integrate with Github, it's better to register it as Github Apps or OAuth Apps. However, this attestation bot will only interact with the Github API once (for each user) so there is no need to register it as Github/OAuth Apps, it just needs the personal access token. After it's attested, the user can remove their Github token. When fiddling around with this bot, there is some tricks that I use to make the development enjoyable. For people who have tasted the front-end development in this century wouldn't want to kill and start an application manually because less time to do something manually means less stress. Since I'm using bundler, I run the bundler in watch mode then run the bundle result when the compiling process is finished. For people who don't want to use a bundler just for a simple application, you can still use nodemon or pm2. If you look at this line, you might notice that it will respect the field name in your package.json file. The name will respect on the folder name that the bot will save the data. So changing the field name in your package.json file will start a new fresh bot. There is a lot of things that I want to try like deploy it in SBC like Raspberry Pi then connect it with ESP8266, communicate with a microcontroller using Byteduino, try to fiddle around with the smart contracts, and many more. I guess I'm out of time for that 😅. I'm aware that the Byteball developer ecosystem is still in growth but overall it quite interesting how the byteballcore was built (I guess it's written before es6 appear). Their approach (in term of software development) is quite simple and yet it solves the fundamental problem (as a result the byteball have many features built-in). I'm looking forward to the growth of the Byteball developer ecosystem. If anyone wants to improve it and host it on a better server, feel free to DM me. I will transfer the ownership of the repo to your github organization. I love it! Good start. Congratulations @drsensor! You received a personal award!